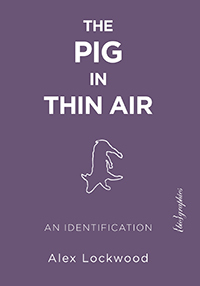 Alex Lockwood in The Pig in Thin Air weaves together important strands of meaning about caring deeply for animals and putting ethics into action. The way in which animals are transformed into food (and other products and services) for human consumption is increasingly challenged. Growing awareness of the inevitable animal cruelty and the harm committed to ourselves as consumers and the environment as the ground in which the exploitation occurs has consequences for everyone. But what to do? The author explains his way, which is in addition to all the customary other ways of consumer boycott, protest, and generally speaking out. As a runner, he marks the final journey of pigs to their murder in a slaughterhouse. We may think more about our minds as the way in which we speak out but also our bodies are vehicles for us to confront actions we oppose and wish to see stopped. This is a powerful and moving story of a vegan runner who runs with the pigs by following them on their way to slaughter.